Transitioning from playing the game you love in front of thousands of fans and TV cameras while getting paid millions of dollars to do so to — well, not that — sounds like a difficult change. Professional athletes retiring in their 20s and 30s have dedicated the bulk of their lives to their craft. Losing the ability to do what they’re best at with so much life ahead of them makes for a significant life challenge. Miami Heat star Dwyane Wade plans to face that challenge head on in the form of therapy. 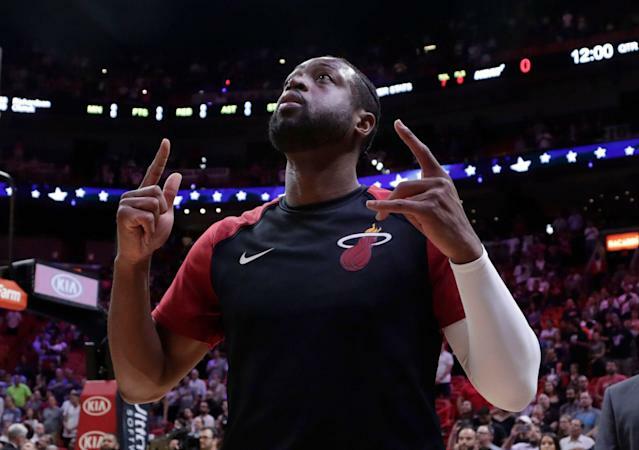 Wade, who intends to retire after this season that will either end next Wednesday against the Brooklyn Nets or with one final playoff run, told ESPN’s Rachel Nichols that he’ll speak to a professional about leaving basketball behind. Wade told Nichols that he’s previously resisted the idea of therapy, but moving past basketball prompted him to change his thinking. "I was always against someone that don't know me telling me how to live my life or giving me instructions,” Wade said. “But I need someone to talk to about it. Because it is a big change. Even though I got a long life to live, and there’s other great things I can accomplish and do, it's not this. So it's going to be different." Wade sounded at peace with leaving the game and his next step in life as he spoke with Nichols alongside his wife Gabrielle Union and their young daughter. His decision to seek therapy sounds like a proactive step rather than a response to struggles he may or may not yet be experiencing. But his candidly discussing seeking therapy is the latest in a long line of athletes breaking down stigmas around mental health, including fellow NBA stars Kevin Love and DeMar DeRozan, who have openly discussed their struggles with anxiety and depression.